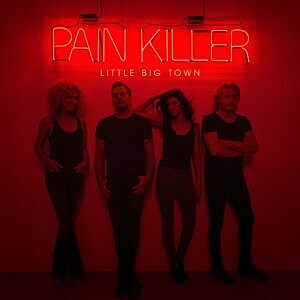 Little Big Town "Pain Killer"
Country group Little Big Town released their sixth studio album Pain Killer yesterday (in the US, international release dates varied). The album features thirteen tracks, written by various members of the group alongside renowned song writers such as Troy Verges and Natalie Hemby. The album's lead single, Day Drinking was released on 3rd June in the US - and was only available recently internationally. The catchy whistling hook and the upbeat pace set through the drums and mandolin quickly seemed to draw fans to the 'good time' track. It's current highest charting position is seventh on the Country Airplay charts. Tumble And Fall is one of the album's strongest tracks in my opinion. Interestingly, it sounds as though a large part of the accompaniment to the track comes from an organ, something that works surprisingly well. The song is really well written with lyrics such as "even in a wild breeze, we can be the best of 'em all, even if we tumble and fall" and "it's the deep end that we jump in, it's the love that we become" painting a picture of fighting for a relationship. My favourite track from the release is definitely Live Forever. The drum beat works well to add another dimension to the balladic track upon it's entry and Phillip (Sweet) delivers a heartfelt lead vocal. The production is led by acoustic guitar and various percussion elements, with the quartet singing completely a cappella at points. Lyrics such as "you and me, wild as a willow in a hurricane, strong enough to stand in the stormy weather" are really touching and are complimented by the group's brilliant harmonies which are evident throughout this track. I imagine it will be amazing live, a absolutely gorgeous track that is a real goose bump moment. The soul styling of Girl Crush is a strong choice and the track is full of clever lyrics such as "I want her long blond hair, I want her magic touch, yeah cause maybe then you'd want me just as much". The simple instrumentalisation leaves the focus on the vocals (led by Karen Fairchild) and the overall lyrics. Throughout the album Little Big Town's song writing skill is evident and the same has to be said for the song writers they have worked alongside. The reggae influences on the album's title track compliment the lyrics, with lines such as "you're my pain killer, a little dose of you goes a long, long way". The song is definitely catchy and has a chorus that listeners will be able to pick up quickly and sing along to. It seems as though album opener Quit Breaking Up With Me will be the next single from the album (unconfirmed). Whilst undoubtedly a catchy song, there are stronger single contenders in my opinion - and stronger songs on the album generally. There are also a few surprising vocals on the album, Jimi (Westbrook) in Stay All Night and Kimberly (Schlapman) in Save Your Sin. In my opinion Jimi's is the more successful of the two with Kimberly's feeling a little strained at points (I preferred her lead vocal in Good People) however it is nice to hear Kimberly singing lead on grittier tracks. Whilst not as surprising as the two aforementioned vocals, Karen's powerful vocal in Things You Don't Think About is also worth a mention, building upon her lead vocal from tracks such as Tornado. Regular blog readers and twitter followers will know I have been a Little Big Town fan for years and before this was released my favourite album was 2010's The Reason Why, that has definitely changed now. This album is a brilliant release and would make a welcome addition to any music fan's collection. Throughout Pain Killer Little Big Town stay true to their roots as well as developing a gritty sound that has been welcomed by fans, contemporaries and press alike. It will certainly be interesting to see how Pain Killer - and the group themselves - fare at next year's awards shows. Little Big Town should be incredibly happy with what they have released here. The harmonies and vocals are on point, the lyrics are well thought through and the overall production on the tracks is sure to make this album a favourite of many listeners. Labels: Little Big Town "Pain Killer"
C2C:Country to Country 2015 line up!